All our pine (as well as all our other firewood) is sustainably harvested from public and private land by licensed loggers. Pine is a great firewood since it’s easy to start (we also include kindling), radiates a steady heat and crackles but does not shoot sparks. Burns well indoors in your fireplace or wood stove or use it for burning outdoors (fire pit, chiminea, weenie roast etc.). Good for taking the chill off and we’ve got lots. 1 Cord: $325 for 1 cord of cut, split and dry pine firewood delivered in Winnipeg*. 2 Cords or more $295 per cord of cut, split and dry pine firewood delivered in Winnipeg*. 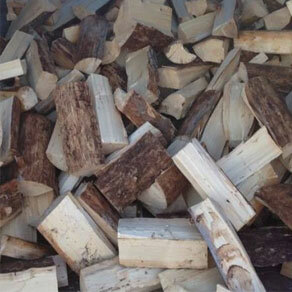 ½ Cord: $195 for 1/2 cord of cut, split and dry pine firewood delivered in Winnipeg*. Stacking available for $75. We’ll stack your firewood where you want it and how you want it and clean up after. All pricing is for stacking outdoors. Indoor stacking also available, but a Quote is required. Delivery is INCLUDED if delivered in and around Winnipeg. Other delivery areas also available, but a Quote is required.